This book is illustrated completely in beautiful full-color, and is the largest and most comprehensive book on the subject. Over 1,000 pieces in classical, Art Nouveau, and Art Deco styles with both luster and non-luster finishes are presented with a photo, description, and current value of each piece. It also includes a wide variety of post-war bone china figurines and recent collector-series items such as Valentine's Day hearts and Easter Eggs. Most of the items presented in this huge volume have never before been seen in print. 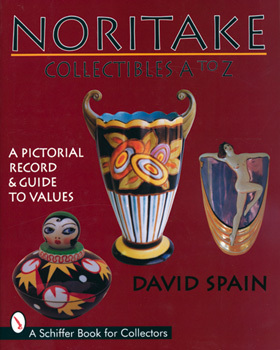 Chapters reviewing the history of Noritake Company and trends in collecting, as well as photos of extremely rare pages from Noritake sales books are also included, and a section on identification of Noritake backstamps, with photos of each stamp, round out the book. This book is the standard guide to this highly collectible field, and is extremely easy to use as a reference tool for both the novice and expert.